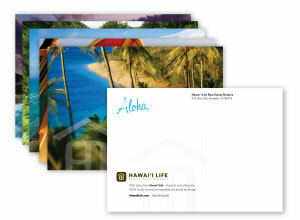 Whether you need blank letterhead and envelopes, pocket folders, stickers or custom Hawai’i Life branded collateral, we’ve got you covered. With a crisp linen texture, our letterhead is classy and elegant. Coupled with a distinct, kraft envelope it is sure stand out. Custom stationery is also available with a minimum order of 500. Email us at Create if you would like more information. To download DIY letterhead templates visit the Letters Page. Pocket folders are free to agents in small quantities and are available in each of our offices. If larger quantities are desired, contact us at Create. With beautiful imagery on the front and an open back with basic HL company info, these postcards are the perfect solution for a quick mailer. Pick up a couple from the offices, hand to your clients, or write a short note and drop in the mail. Contact us at Create if you would like to place a bulk order. Leave a copy of your listing presentation behind in our kraft self-enclosed folder. Folders and hardware are available in each of our offices.